As mentioned by the error page, because of security concerns this configuration will only affect errors seen when accessing the server through a local address. This approach may not work on a testing or production environment, for example when the site that is in error lives behind a host name and requests are routed over the internet. 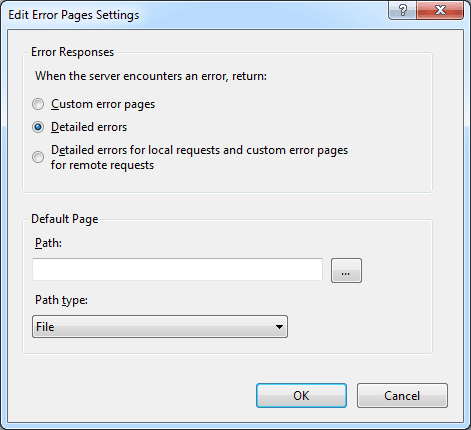 When you select ‘Detailed errors’, IIS will display the detailed error page for all failed requests, even remote ones. Please note that this setting should be switched back after discovering and solving the error you were looking for, since detailed errors can emit sensitive information about the inner workings of your application which can be abused by attackers. This entry was posted in Tech and tagged debugging, IIS, web.config. Bookmark the permalink.